The Ninth, the day after tomorrow, will be the big day. Mr. Wonderful and I are going to get hitched! 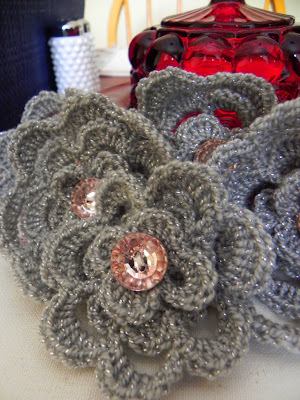 Little sparkly flowers for the ladies to wear. I made them out of the same yarn as my shawlette and I put pin backs on them. I am not convinced I love them. But, it's too late now. The shawlette it being blocked at the moment and is pinned to a plaid couch in Mr. Wonderful's man cave. I'll see about getting a picture that won't scare you too much. We're going on a road trip for our honeymoon. We're taking the Yaris and heading south after dinner. Hopefully we'll be able to find some sun. And warmth!